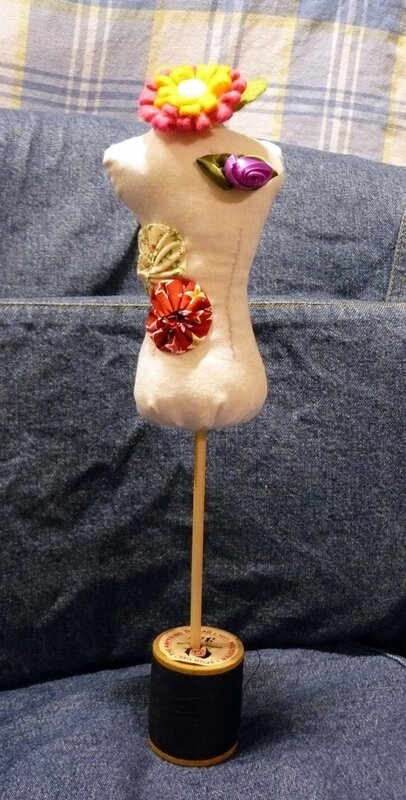 The theme for the January/February Pincushion Challenge was "Try Something New." I had printed out this free pattern for a cute dress form pincushion ages ago but I never got around to tackling it because of the darts. I haven't sewn clothing yet, and I didn't really *get* darts. I mean, I understand the concept, and there are tutorials on how to sew the triangular kind, but I hadn't see anything that showed how to do the curved kind. Anyway, so I did them. And you know what? Not so hard at all. Quite simple, really. Maybe my "Try Something New" should have been to finish the pincushion before the last day of the challenge. Now that really would have been something new. nice to meet you and thanks again for the tutorial! What a fun pin cushion! Love yours! Thank you for sharing the pattern. I used to do more needlework and would love to get back to doing more again. ack!!! can you believe i've had that same pattern printed out for some time now...and i too got scared of the darts...of course mine would be "hand-stitched" darts...eeek. you've inspired me to look at that pattern once again. I´ve done the same pattern!! I just have finished it at last weekend.. with orange felt.. and I used a support from another pincushion..